Often referred to as either 'Diapers', 'All-in -Ones' or 'Slips' depending on the brand, this category of products are an excellent choice for managing heavy to severe urinary incontinence and/or faecal incontinence. They normally offer the highest levels of absorbency in any range of incontinence products and as such are a particularly good choice for overnight use or those confined to a bed. Choose from market leading brands Lille Healthcare and Attends, all of which provide the following common features to help ensure maximum anti leakage security and optimal comfort. 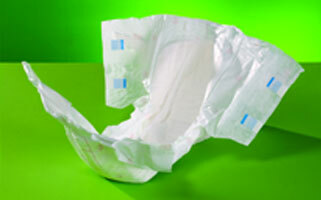 More Absorbency: Super absorbent core in the centre of the pad to optimise absorbency level. No Leakage: Hydrophobic elasticated leg cuffs prevent sideways leakage. Wetness Indicator: Indicating when the pad should be changed for maximum comfort.